My knitting projects for Friends and Charities. 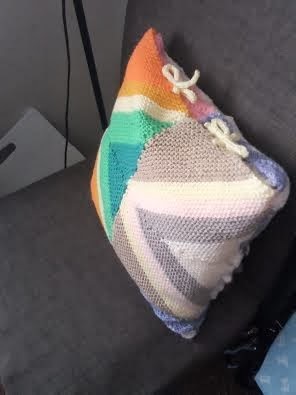 I was making a Bright and Bold Blanket in the knit a square a week challenge from the book 200 Knitted Blocks but I changed the plan and it is now a cushion cover. Why the change I hear you ask? The reason is simple I needed a cushion for myself as I have a prolapsed disc in the spine pressing on the sciatic nerve and I can barely walk. Laying down is not an option any longer last night I was in a lot of pain and could not move without assistance. I need a cushion to go under my knees as I sit propped up with pillows so I can try to sleep. This problem has been slowly getting worse since Christmas and I am to see the Physio Therapist on Friday. She thought I would be going in saying things were a whole lot better well the reverse is true. So I got the cushion filler I had put away for another project and decided to use it for myself. The only thing was I had no Cushion cover to fit. Then I thought of the squares I had made and sewn together. I folded them in such a way that I created a pocket and sewed the sides together. I made some I-cord ties to close the top and sewed them on so I could make a neat bow and hey presto the perfect cushion for under my knees and for using in a chair as well. The I-Cord was really easy to make I have never tried doing it before but know I know how to I will be making it again. Knit across the row and slide the stitches to the end of the needle and knit across the row again. The yarn is always on the left side don't forget to slide the stitches each time to the end of the needle. Some people Bind off some finish off the same way as in the video link I gave either way works. I made my I-Cord 6 inches long and made four of them for my tie closure it was enough to make a neat small bow with. Thanks for the video link. I finally understand what an i-cord is! Can't see the pattern you wanted? 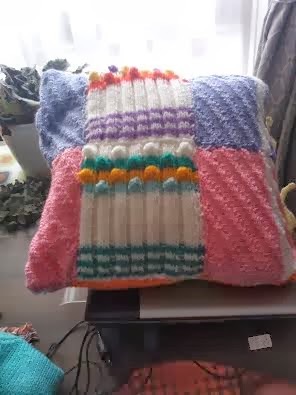 If you are looking for a pattern please use the Search this Blog it will take you there.